The section of Russia between the Siberian cities of Krasnoyarsk and Novosibirsk features unexplored mountains, some of the world’s longest rivers and Russia’s third most-populous urban center. Heading west from the Trans-Siberian Highway’s easternmost point on the Sea of Japan, you go through several thousand kilometers of mountains and taiga forest. Once you reach the city of Krasnoyarsk in Eastern Siberia, the landscape begins to flatten as you enter the center of Asia, the roads improve and you can easily drive between major cities in a day. On a road trip across Russia the city of Krasnoyarsk marks the halfway point. Krasnoyarsk is split in half by the Yenisei River, one of the longest rivers on Earth and the heart of the city. Images of the Krasnoyarsk Bridge and the local Divnogorsk hydroelectric dam are featured on Russia’s 10-ruble banknote. While Krasnoyarsk is a pleasant city, consider staying just outside town at one of several hotels near the Stolby Nature Reserve. The rustic-themed Snezhnaya Dolina has a pool, sauna, tennis court and cottages ($100 a night) or rooms ($25 a night). You can easily park your car here and be just a quick bus ride from Krasnoyarsk or the nearby nature reserve. On a map the Trans-Siberian Highway often curves diagonally between major cities. Early Russian adventurers traveled across Siberia along its many rivers. Consequently, many Siberian cities were founded haphazardly at favorable locations on these waterways. As a result, the Trans-Siberian Highway zigzags across northern Asia to link each of Siberia’s largest cities. 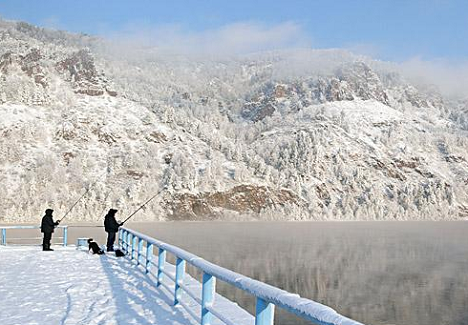 In Krasnoyarsk you have the opportunity to explore the Yenisei, one of Russia’s great rivers. Sayan Ring can arrange an eight-day river tour ($3,000) on a passenger ship that visits points of interest including a small village where Vladimir Lenin was once exiled, the headwaters of the Yenisei and a local shaman who reads fortunes. You can also take a trip up the Yenisei all the way to the Arctic. The trip requires advanced planning and special permits to enter the remote cities located near the end of the river. The 4,000 kilometer roundtrip cruise from Krasnoyarsk to the distant river port of Dudinka lasts 10 days. Tour operator SibTourGuide can help arrange the trip for between $80-380 depending on the class of cabin you choose. From Snezhnaya Dolina, head east on the M-54 Highway and take the exit at the roundabout for the Kommunalny Bridge. After crossing the bridge, drive straight on ul. Veynbauma and turn left on ul. Bryanskaya where Veynbauma ends. Continue until you reach the M-53 Federal Highway to Novosibirsk (11.5 hours, 800 kilometers). Driving west from Krasnoyarsk, plains give way to the Kuznetsk Alatau Mountains, one of the last significant ranges that you will encounter driving across Russia. One of the best places to access the mountains is south of the highway in the city of Abakan (5.5 hours, 415 kilometers from Krasnoyarsk). June is one of the best times to visit when the hills abound with wildflowers. You can also see bear and reindeer here. Contact Siberian Trekking for more information. On the other side of the Kuznetsk Alatau Mountains lies the city of Kemerovo (seven hours, 530 kilometers from Krasnoyarsk) on the Tom River. Often overlooked, Kemerovo is right on the M-53 and features a lovely downtown. Kemerovo is located in the Kuznetsk Basin, one of Russia’s chief coal-mining regions. In 1921 several American socialists were given Lenin’s blessing to found the Kuzbass Autonomous Industrial Colony here with the aim of jumpstarting local industrial projects. A recruitment center for the colony was established in New York and thousands of Americans moved to Kemerovo and lived with local Russians, working together to significantly increase coal production in the area. Spend an afternoon exploring Kemerovo’s history at the Krasnaya Gorka Museum, which stands on the scenic red hills above the city overlooking the river. The museum tells the story of Kemerovo’s coal industry and includes an underground chamber with exhibits showing miners working at stone walls with pickaxes. The city of Tomsk (3.5 hours, 220 kilometers from Kemerovo) is 100 kilometers north of the M-53. Although slightly out of the way, Tomsk is home to some of Siberia’s oldest buildings and is well worth the trip. Tomsk was founded in 1604 and quickly became an important trading center, although the Trans-Siberian Railway later bypassed it in favor of Novosibirsk, which at the time was just a village. Tomsk is not directly connected to the Trans-Siberian Highway, but is an excellent diversion as the city is home to Siberia’s first university and to this day has a large student population. Take a walk through the center along Prospekt Lenina and by the Tom River waterfront to see the impressive buildings of Tomsk State University, the city's famous monument to Chekhov and wooden homes from another era that still stand in this modern city. Sayan Ring has a comprehensive guide on sightseeing in Tomsk on their website. From Tomsk you’re just a short drive (four hours, 260 kilometers) from Novosibirsk, Russia’s third-largest city. If you began at the Sea of Japan in Vladivostok, you will have crossed about half of the Eurasian continent when you reach the city limits of Novosibirsk.